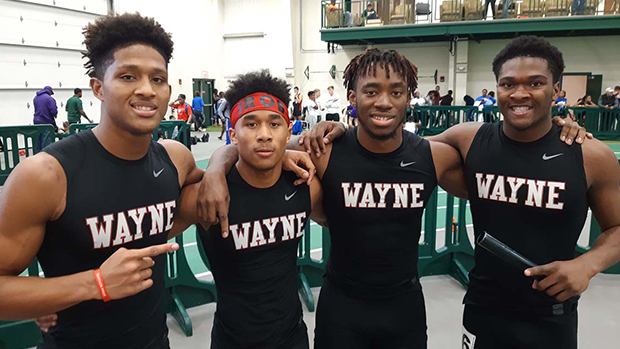 The squad from Wayne looks like they're starting their outdoor season right where they left off during the indoor campaign. The 2019 Indoor State Champions on the boys' side collected a number of top placements at the highly competitive Olympic Trojan Invitational in Charlotte, North Carolina on Saturday. Zarik Brown led the Huber Heights-based Warriors team with a trio of top two placements in the individual events. Brown went 10.81 for the 100m victory and he clocked 21.35 for a second place showing in the 200. His 48.54 winning effort in the 400 was his new personal best at the distance. Senior class athletes Justin Harris and Lucas Houk also earned event wins. The Xavier University bound Houk took first in the 1600 with his time of 4:24.48 and Harris went sub 57 for the 400m hurdles triumph. His official result was 56.99. In addition to their first place finishes, Houk captured third in the 800 (1:59.98) and Harris was the runner-up in the 110m hurdles (14.70). Harris ran a slightly faster time in the prelims contest (14.58), where he was the first overall finals qualifier to cross the line. The formidable Wayne relay team, shown at Tiffin University during the indoor season. Wayne showed no signs of rust and made the most of their trek down south, as they claimed the boys team win. In addition to the aforementioned performances, they took first in the 4x400 (3:21.69) and third in the 4x100 (43.05). In field event action, Reed Feagle placed second in the shot put with a toss of 50-8 and tenth in the discus with his throw of 104-0. Evan Fair vaulted 12-0 for the third spot in the pole vault standings and Brian Hill leaped 6-0 to land in a tie for sixth in the high jump. On the girls side, junior Mya Beaudion led the way by finishing fourth in the pole vault competition due to her 9-6 clearance.